Archbishop Desmond Tutu once said, “In our world we tend to be blind to our connection until times of great disaster. We find we start caring about people in Timbuktu, whom we’ve never met… and yet we pour out our hearts. We give resources to help them because we realize that we are bound up together. We are bound up and can be human only together.” The Field Relief Agency of Taiwan and Formosa Budding Hope Association are two organizations that are bringing Taiwanese resources to people most Taiwanese will never meet, binding us together with the underprivileged people of Cambodia and bringing them hope amidst hardship. Heavy rain has turned the bumpy dirt road muddy on the two-hour-plus car trip from Poi­pet to Lo­vea, in Bat­tam­bang Province. Bouncing along the road, we sway and rock as we head for ­Dongpo Lo­vea Temple, where we receive a rapturous welcome. As we arrive accompanied by people from the Field Relief Agency of Taiwan (FRA), one person is welcomed particularly enthusiastically—Yang Wei-lin, FRA secretary-­general. Yang has gathered donations from both Taiwanese and the international ethnic Chinese diaspora, and is there to host the ribbon cutting ceremony marking the com­pletion of a new crematory. Dongpo Lo­vea Temple was built in 1910 and was almost entirely destroyed during the Cambodian civil war of the 1970s. Since its reconstruction, it has become the central focus for four or five nearby villages, not only hosting weddings and funerals, but also serving as a place of worship for local villagers every eight days. The ribbon cutting cere­mony is a major event for Lo­vea. Almost every resident of the area is present, all dressed in white formal attire, the women in sampots and over 1,000 schoolchildren in their uniforms. The mood throughout is solemn and respectful. With the inauguration of this crematory, the FRA will have helped with the building of 137 crematories across seven provinces around Cambodia. “In rural Cambodia, if the local temple doesn’t have a crematory, when people pass away they are usually just laid on the ground and burned. Sometimes they don’t burn completely, and the bones get trampled by cattle or carried off by stray dogs,” explains Yang. 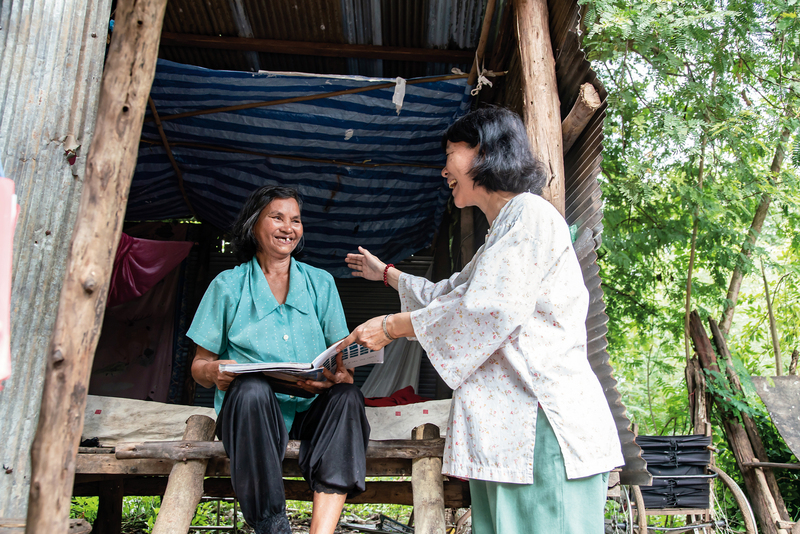 Having invested over two decades into poverty alleviation, education and emergency relief in Cambodia, Yang turned to building crematories after the death of a woman with AIDS that the FRA had been working with for years. “I couldn’t bear to not help after that,” she says. The woman in question was sold into prostitution as a child. She later married, and unfortunately developed AIDS after a few years, infecting her husband and going on to bear three children with HIV. Eventually, her husband abandoned her and she passed away from the disease. With no coffin, she was simply burned on the ground. Her three children, dressed in white for mourning, watched their mother’s cremation. Contorted by the flames, her body seemed to spring up, driving shocked observers back and terrifying the small children beyond tears. 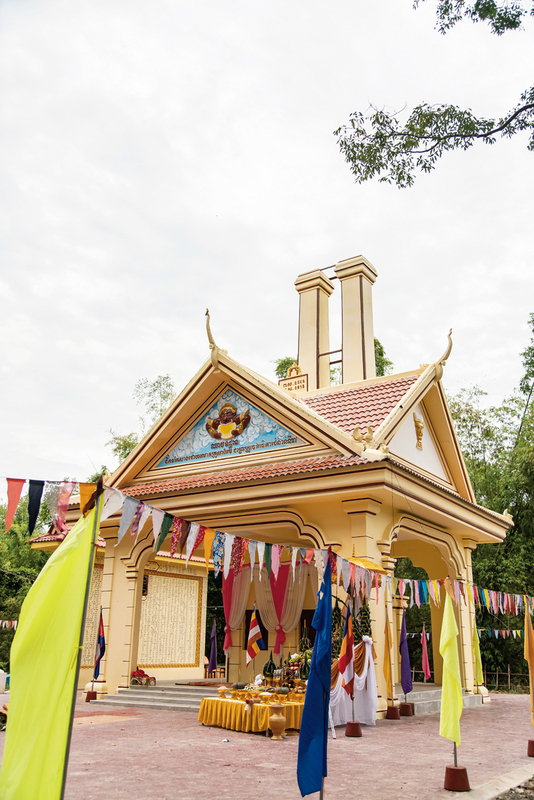 Yang, who was watching from the sidelines, decided then and there to build a crematory at Poi­pet’s Sras ­Trach temple, to give people in such tragic situations some dignity in death and avoid compounding the grief of the bereaved. 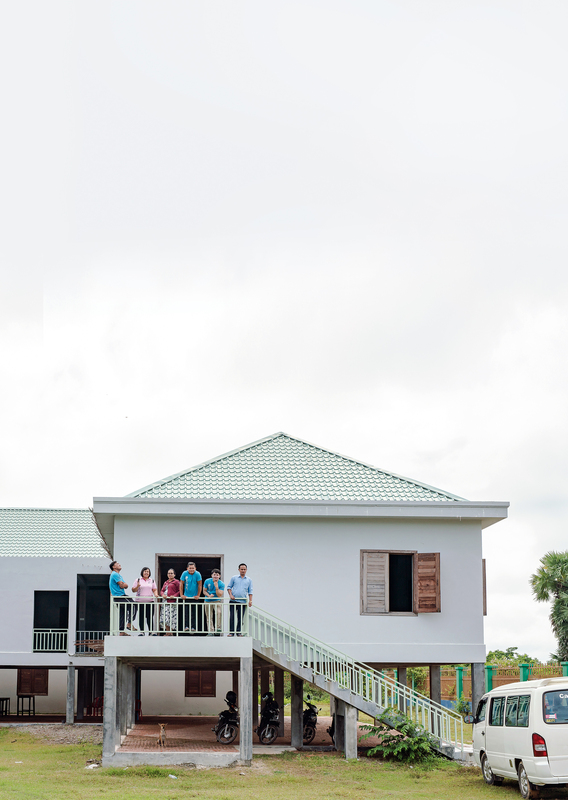 “It rains frequently in Cambodia, but amazingly the moment I cut the ribbon on that crematory, the rain completely stopped,” says Yang, her faith in the power of good deeds evident in her voice. Engraved onto the crematories are the names of donors from Taiwan and Hong Kong in both Chinese and Khmer, bringing blessings from afar to the people of Cambodia, like a bodhisattva with the power to end suffering. We accompanied Yang on a visit to inspect a well project. According to UN statistics, as much as 70% of Cambodia’s population has no access to running water. 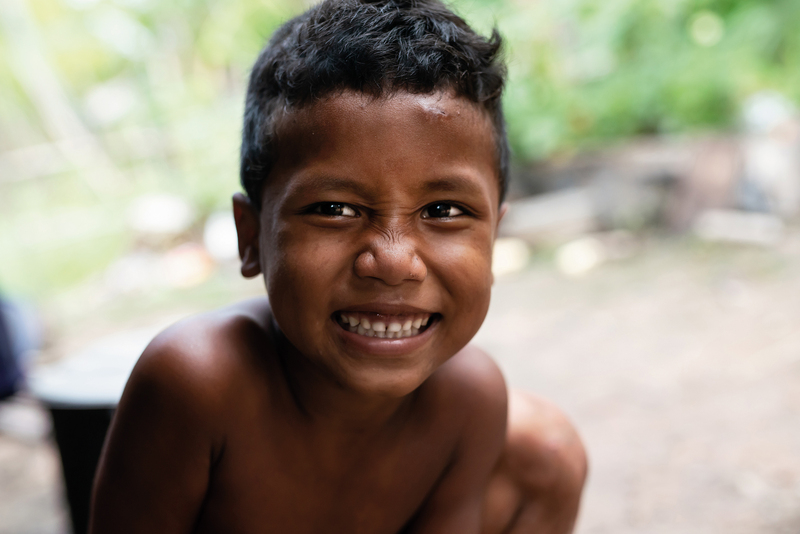 The water people in rural communities use tends to be rainwater or drawn from local streams, and during the dry season they not only have to deal with a lack of water, but also face increased odds of catching dengue fever, malaria, or gastrointestinal diseases. 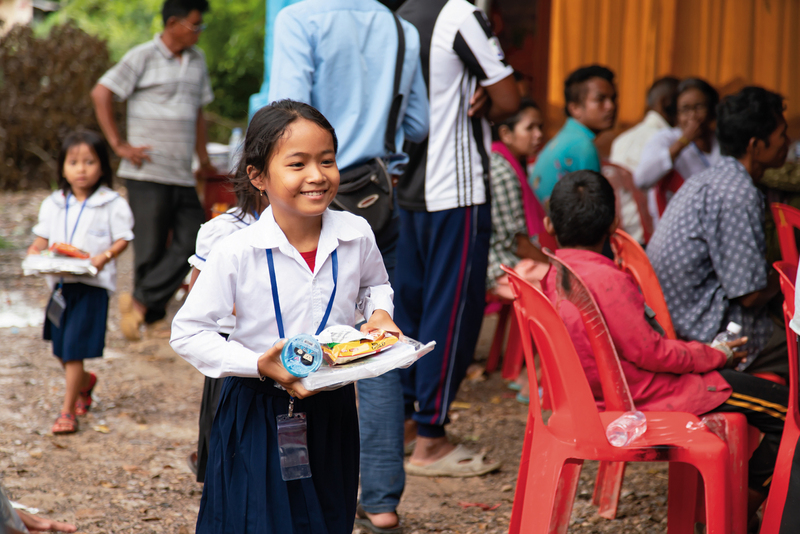 Since 2015, the FRA has been collecting donations for specific uses, like sinking wells for schools in rural Cambodia; to date, they have completed 50 such wells. With a well, not only do teachers and students not need to take a bucket of water with them to use the toilet, an hour of motorized pumping can fill a large tank with clean water, and children can even take water home for their families to use. But these wells are more than just the cleanest water sources available locally; the water from them will be invaluable in the long-term development of these communities. During our visit we see many of these wells and cremat­ories that the FRA has constructed in rural communities, but Yang also reminds us with a smile that in fact her background is in education, and she is also principal of the FRA Secondary and Vocational High School in Poi­pet. 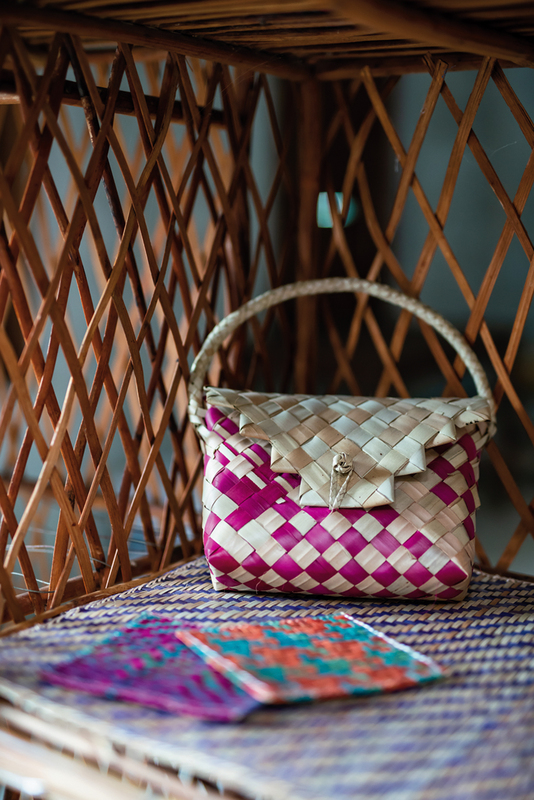 This school, with its red-tiled roof, wooden window frames and traditionally decorated eaves, was built with donations from Taiwan, but is brimming with ­Khmer style. The only high school in a five-village area, it currently boasts a roll of over 300 students between seventh and tenth grades. Yang began her work in Cambodia in 1987. At the time, she was a flight attendant with China Airlines, and had volunteered to aid in a Thai refugee camp. With the Thai‡Cambodia border area still a war zone, she often saw firsthand the devastation and extreme poverty the Cambodian refugees were suffering under in the wake of their nation’s civil war. She decided she wanted to stay, settling in a village known as “Landmine Village” despite the difficult conditions. She began taking in homeless orphans along the border who were surviving by begging, and in 1995 she established the Field Relief Agency of Taiwan. Over the past two decades, the FRA has provided relief in the form of education. “Ultimately, only education can end the cycle of poverty that the civil war began and help the poorest stand on their own feet.” Behind Yang’s desk in Poi­pet hangs a huge map of Taiwan. She works to collect donations of money and supplies from Taiwan and ship them to Cambodia, and has already helped to build or rebuild some 18 Chinese-medium schools in the country, as well as the FRA Secondary and Vocational High School. The people of Taiwan have also generously donated stationery, textbooks, and student stipends, all of which have reached over 70,000 students so far. 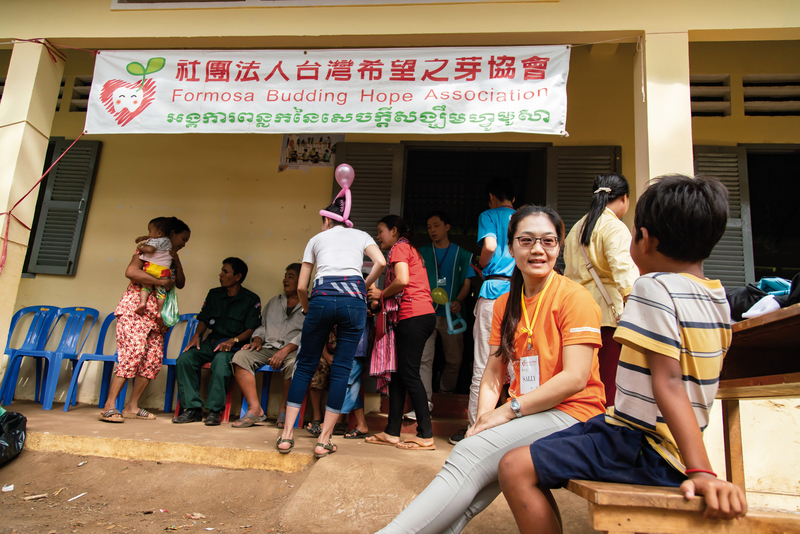 Next, we leave Landmine Village and join the Formosa Budding Hope Association as they take their services to Siem Reap, known as a “must see” tourist destination. There, the poor live in traditional stilt homes, their roofs made with palm leaves. These homes lack walls, though, because their residents simply can’t afford to build them, instead substituting rags or tarpaulins. Their cookware sits at the feet of trees, their homes bereft of furniture beyond secondhand suitcases that hold their most valuable possessions—their IDPoor cards—and a few clothes. With a list of impoverished children provided by the government of Angkor Thom, and after visits by social workers for confirmation, the Budding Hope Association provides some NT$700 and 15 kilograms of white rice per month to each family. When the children come to collect these items, the association also gives them something to eat such as bread or boiled eggs. But the children always ask if they can save them instead of eating them on the spot, so they can take them home for their younger siblings. The worse their situation, the more the children value these small blessings and want to share them. 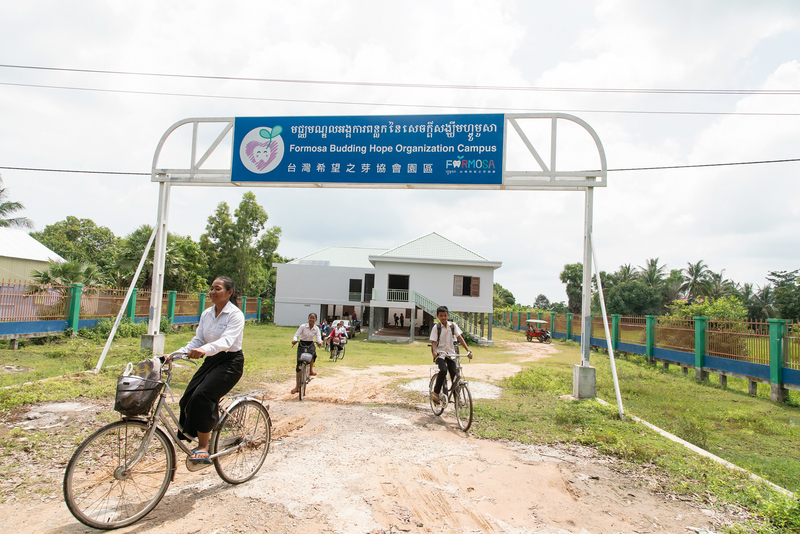 The Budding Hope Association has set up a vocational training center in rural Angkor Thom, supported by ­Taiwanese tiling company Champion. However, while the center may have a home, it has until recently lacked electricity despite power poles being put up two years ago. To address this, Taiwan’s Industrial Technology Research Institute has taken the lead by installing solar panels at the center, making it the area’s first place with power as of early 2018. 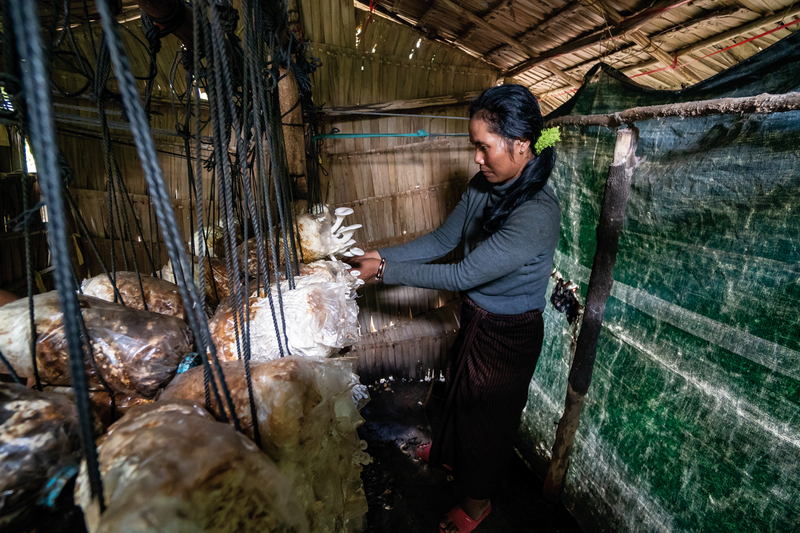 The association has also taken to teaching the locals to grow mushrooms; however, their social workers found that imperfections in the vacuum packing of the oyster mushrooms delivered to the farmers meant they wouldn’t grow. Experts from the Taiwan Agricultural Research Institute set to work on the problem, and after they found a solution, the first batches of mushrooms harvested brought in enough income for families to start getting back on their feet, with some of them laying wooden boardwalks in front of their homes and others buying a dozen or more chickens to raise. 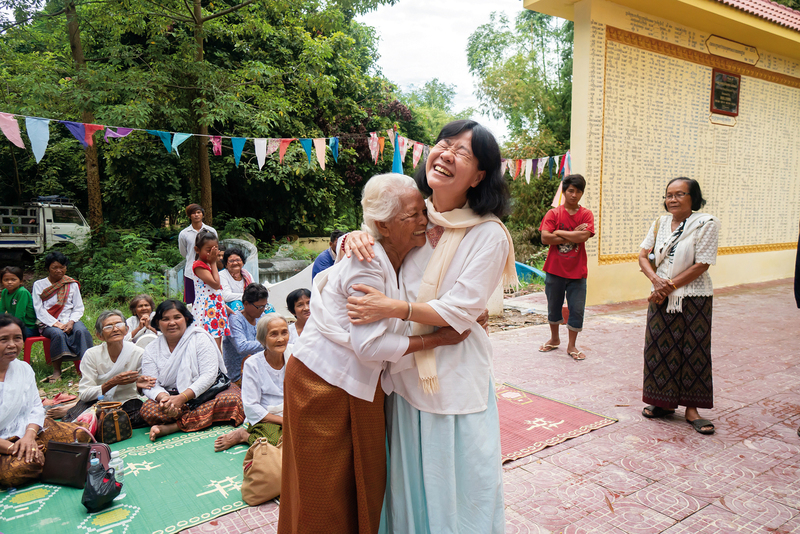 “I really consider Cambodia my ‘comfort zone.’ I can really be of use here.” Yu draws on the example of Mother Teresa, who once said that love is seeing what others need and seeing your own responsibilities even amidst suffering. Through the examples of both the FRA and the Budding Hope Association, we can see that while Taiwan may be small geographically, with the combined wisdom and resources of her people, she can produce great amounts of love.